When I’m in the need for recipe ideas, I go to my Granny J. She’s one of the best cooks I know and she has also lived/traveled all over the world. This has endowed her with quite a bit of experience that I can learn from. 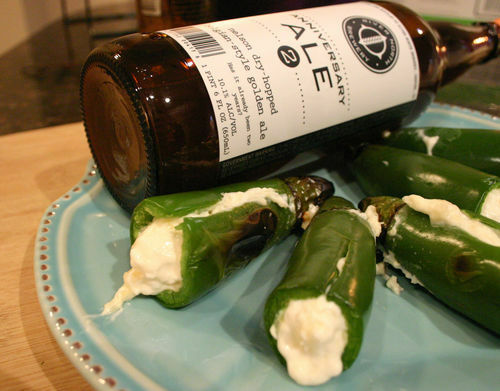 This particular recipe, pineapple-cream-cheese stuffed jalapeños, hails from the good ol’ state where bigger is better – Texas. From these ingredients, I can tell those Texans love big flavor without too much hassle. 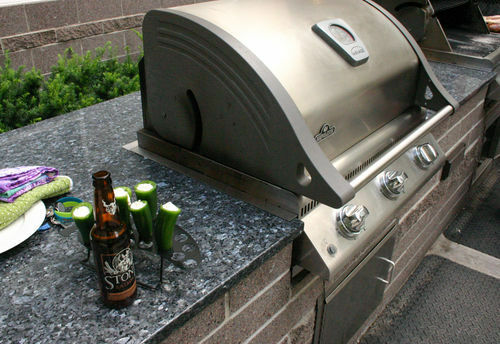 As for the beer, it didn’t take long to think of the perfect addition. 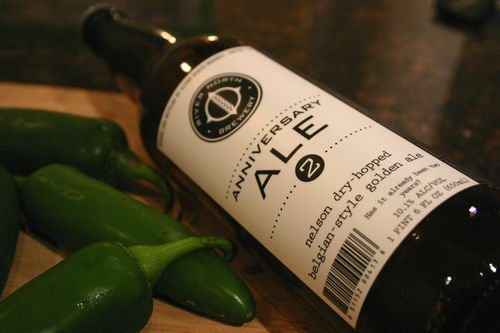 Anniversary Ale 2 popped into my head within a few minutes due to its bright, tropical sweetness. 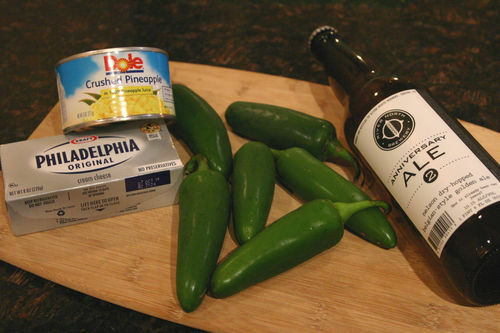 When mixed in with the pineapples and cream cheese, it added a yeasty component that made this recipe even more special. 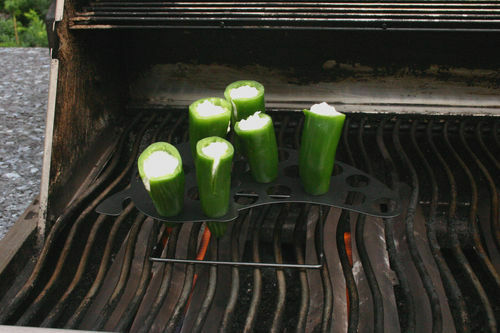 Jalapeño grilling stand – was easy to find during the summer. You can also order them online for cheap. I already googled them for you here. 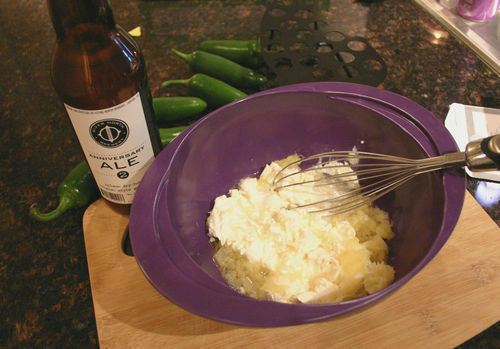 Whip together the cream cheese, pineapple, and the tropical and sweet Anniversary Ale 2. Set the stuffing in the refrigerator until its time to fill the jalapeños [since it’ll be cold, it won’t melt so fast on the grill, allowing the skin of the pepper to cook more before the cheese oozes out]. Wash the jalapeños, grab some gloves, and possibly even safety glasses. 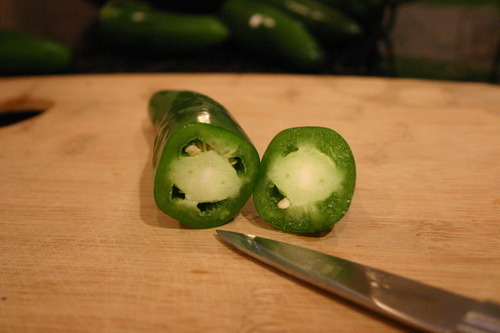 Can you imagine what it would be like to get jalapeño juice in your eye? Yikes. 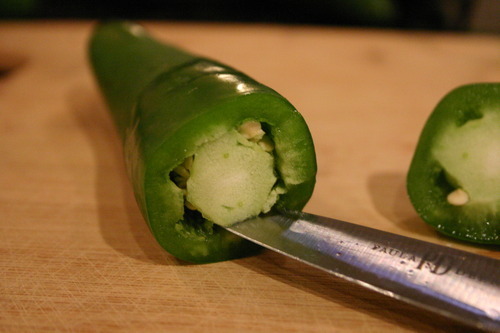 Cut off the tops of the jalapeños and slide the knife down the veins, while doing your best not to cut open the pepper. Pull out as much of the veins and seeds as possible. This is pretty hard to do, so a small slit may need to be made down the side to aid you in this endeavor. 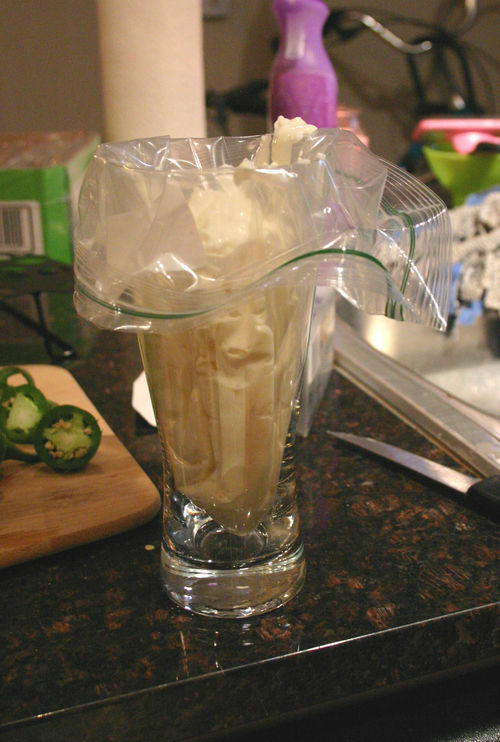 After you’ve removed as much veins and seeds as possible, put all the cream cheese in a big Ziploc bag and cut a hole in the corner to make a disposable piping bag. I use a cup to help when I don’t have friends around. 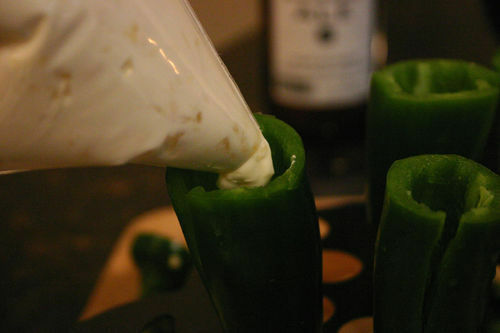 Before I stuffed them, I put the jalapeños in the stand [oh yes, you need a stand] – it made everything easier. 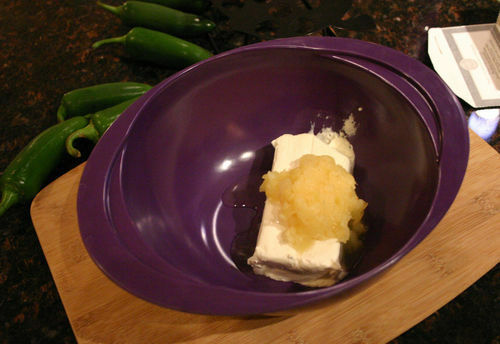 Once they are in place, fill them with that cheesy goodness! Next, heat up the grill to 450°F and let the jalapeños cook for about 5 minutes or until they are slightly charred around the sides. When they are finished, the cheese should be ooey-gooey and ready to go into your belly! 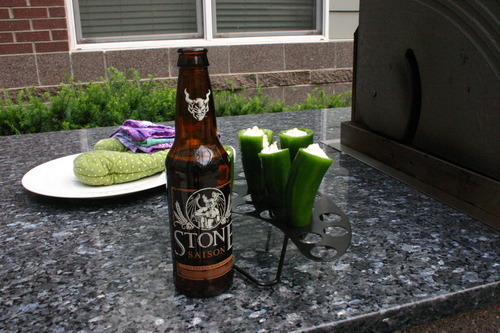 Stone Saison was not in the recipe but it was delicious to drink while grilling.